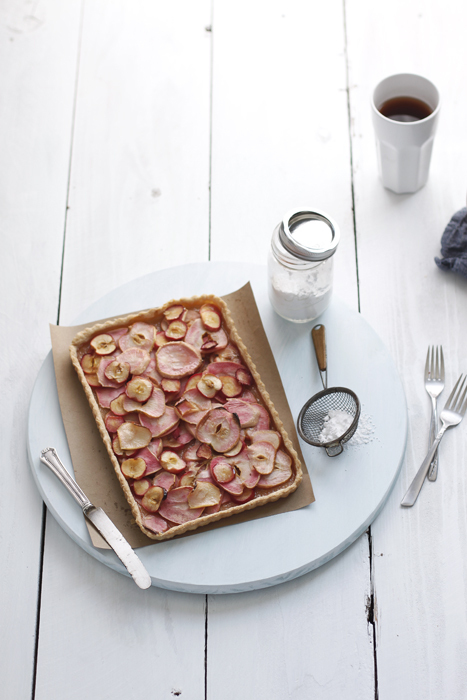 Pink Pearl Tart — always with butter. These amazing little apples look perfectly average from the outside but once you cut into one, you see the magic of their pink flesh. Pink pearl apples were introduced to me by my coworker Melissa. She said she saw them and instantly knew I needed to photograph them, and she was right! Not only are they beautiful but they taste amazing. And being available for only a month out of the whole year, it makes them truly special. 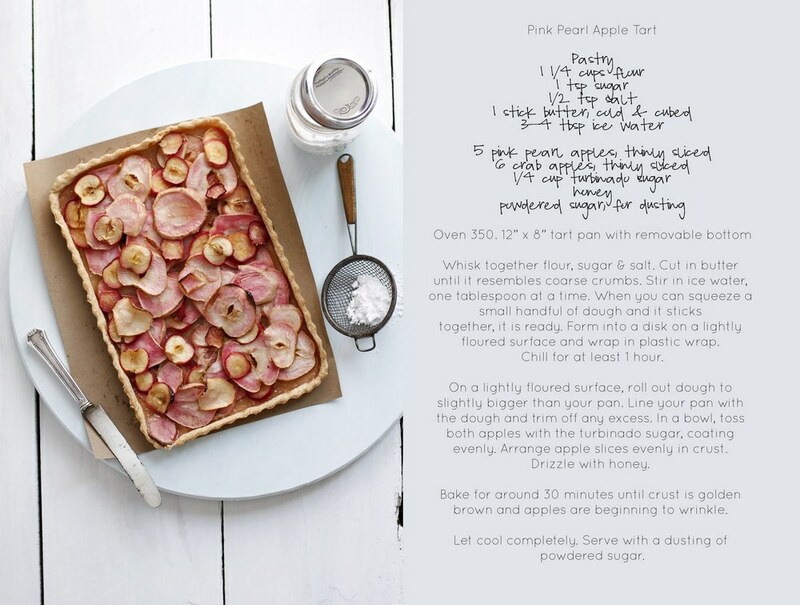 Such a special apple needed barely anything to accompany it, so this is a very simple tart recipe. A bit of honey, a dash of sugar and a classic crust. Get some good vanilla bean ice cream, or make your own! and you will be set. While at work today filing the case with cupcakes, I look out the window and who do I see parking in front of the shop? One of my photo teachers from college! I stared for a minute, then realized it was her and yelled, 'Nigel!! HELLO!!' It was such a nice surprise. Where I went to school is almost two hours away from the shop so I never run into anyone I know. I miss photo classes so much, especially hers. She encouraged critique, discussion and made people say what they thought of the photo. Not just a 'I like it' 'How nice' response that most people give. A nice little surprise in the work day, off to go edit photos of my new baby cousin! She's a little wiggle worm so many photos to go through. Whisk together flour, sugar & salt. Cut in butter until it resembles coarse crumbs. Stir in ice water, one tablespoon at a time. When you can squeeze a small handful of dough and it sticks together, it is ready. Form into a disk on a lightly floured surface and wrap in plastic wrap. Chill for at least 1 hour. On a lightly floured surface, roll out dough to slightly bigger than your pan. Line your pan with the dough and trim off any excess. 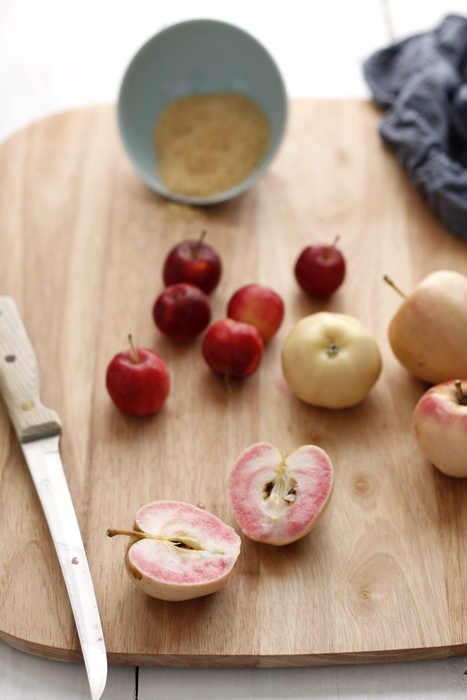 In a bowl, toss both apples with the turbinado sugar, coating evenly. Arrange apple slices evenly in crust. Drizzle with honey. Bake for around 30 minutes until crust is golden brown and apples are beginning to wrinkle. Let cool completely. Serve with a dusting of powdered sugar.